The historic County of Perth is fittingly called the ‘big county’ owing to its vast borders stretching from Strathmore in the east, Pass of Drumochter in the north, Rannoch Moor and Ben Lui in the west and Aberfoyle in the south. The county comprises of mountains and lowlands while the principal county towns lie within the low grounds created by dales of the River Tay and River Earn. The city of Perth once served as the capital of Scotland, graced by the presence of royals and wealthy noblemen; therefore, it only fits that the City of Perth is well known as the Dark Age capital of Scotland. Scone Abbey, the site of the royal coronations took place in proximity to the city of Perth. The north of Perthshire lies on the Grampian Mountains and provides many great views of the Grampians not to mention numerous walking trails. Ramblers can choose from one mile to 100-mile trails all while savouring the captivating landscape, lochs and many popular attractions along the way. Other must-see attractions include the Aberfeldy distillery, Scotland’s oldest record shop Concorde Music, Kinnoull Hill for great views and hiking, Balhousie Castle, Drummond Castle and the worlds highest hedge - Meikleour Beech Hedge! Choose your Perthshire motorhome hire and see the former capital of Scotland and its gorgeous architecture! I am SwiftEscape685, hire me today! Looking for a Scottish adventure, look no further. 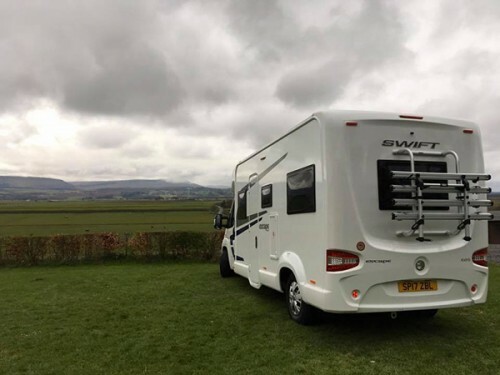 Hire our 2017 luxury Swift Escape Motorhome and tour Scotland in style. Caledonian Tourers is a family run business based in Perth. Our Motorhome is fully equipped with all that you are likely to need for your adventure. Autocruise Oakmont definitely takes the accolade of most luxurious van. It has ample space around the beds and provides lots of flexibility for 2-4 people to live in comfort.